I love savoury muffins, much more than the sweet kind. Savoury muffins make a great snack, a good meal with a side salad and work well in a lunchbox where 10 seconds in a microwave will revive them, making them great for taking to work. They also freeze well. Muffins are really easy to make, just chuck all the dry ingredients in a bowl, throw the wet ingredients in, stir briefly until just combined and cook for 20 minutes. You can put anything you like into a muffin (within reason) and they’ll almost certainly be delicious. I ate these ones warm, with some Butter Me Up from Half Pint Vegan Dairy and some red pepper relish. Roughly combine all the ingredients in a large bowl except the egg replacement, liquid and oil. Mix the egg replacement, liquid and oil in a small bowl. Add the llquids to the dry ingredients and mix until just barely combined. Drop the mixture into a greased muffin tin and bake for 20 minutes. 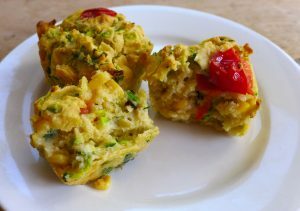 Ooh I love savoury muffins too! The flavours in these sound delicious and with some half pint butter…omg. I have only had the one tub that I picked up at WVD, I wish it wasn’t so expensive…what with my Miyoko’s addiction as well I’m going to go broke!